“Original Gangster” Take a step into the dark side and enjoy some delicious OG. This perfection of classic flavors has a certain originality in it’s badassness. Many flavor connoisseurs have been unable to discern even the two main ingredients, fresh banana and creamy peanut butter, amongst several rich secret ingredients. This is on complex profile, and boy is it tasty! This is one for the flavour connoisseur, it satisfies on many levels. 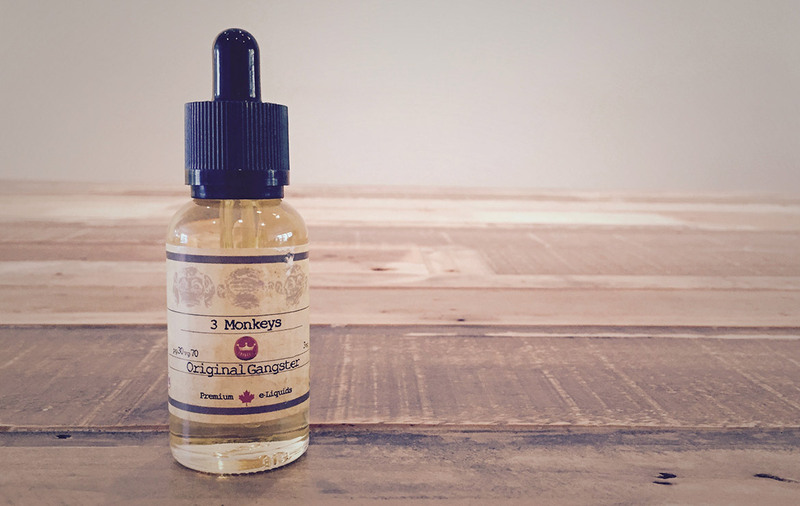 It’s one of those juices that crosses several flavour types, It’s Fruity, yet rich with a nice hit of Peanut Butter without being dry, and there is a note of Rum that Beverage lovers with enjoy. There is a note of Custard in there too that keeps it all well rounded. The Front is a wonderful mix of flavours, Peanut Butter, Banana and a note of Custard that all blend perfectly together. The Back keeps it interesting with notes of Fruit, a bit more Peanut Butter, Banana and a surprising note of Rum. This is definitely a juice to savour. 3 Monkeys seems to get all their profiles right and this is yet another one you should check out. Heat: Stands up very well. Loses the Peanut Butter with Heat. Packaging: Classy Bottle, Decent Label (No URL & it isn’t juice proof), Fine tipped dripper.